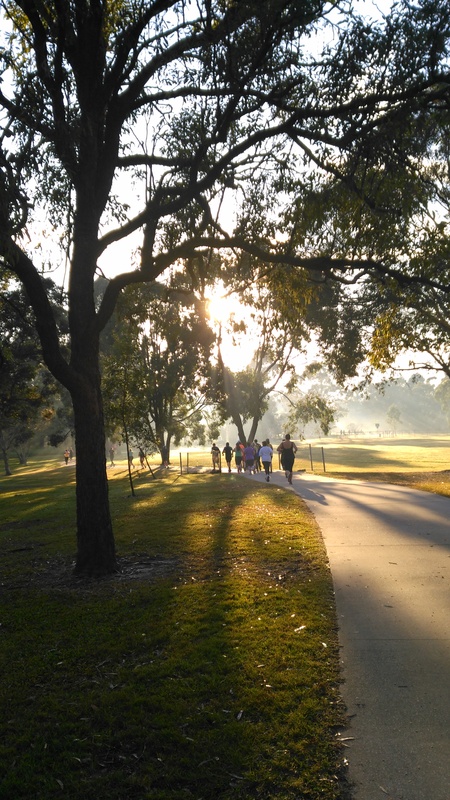 The day started off early, when I joined some friends undertaking a parkrun trial, i.e. a trial run of the course, for a new event due to start it’s weekly Saturday free runs soon. Intended to give the new volunteers and leaders a bit of practice, and ensure they’ve marked the course appropriately with either signs or marshals, as well as testing the kit (timing and scanning), having several hundred people turn up to run does indeed provide a good test. 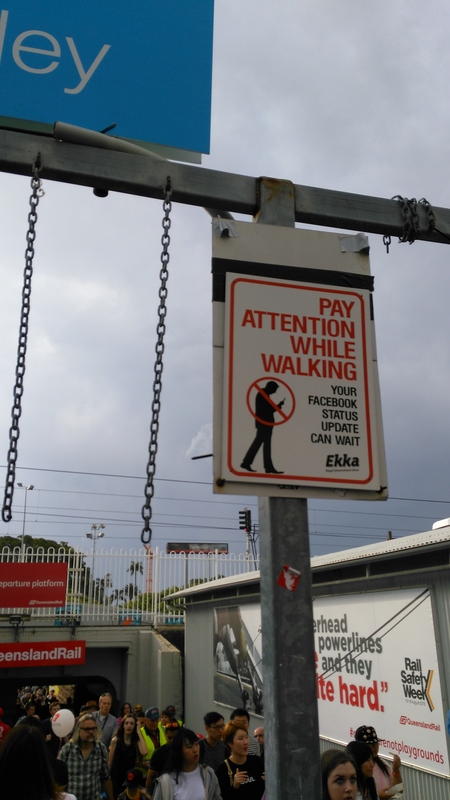 And why were so many people available at 7am on a random Wednesday you may ask….I think in part this was due to it being Ekka day for many. 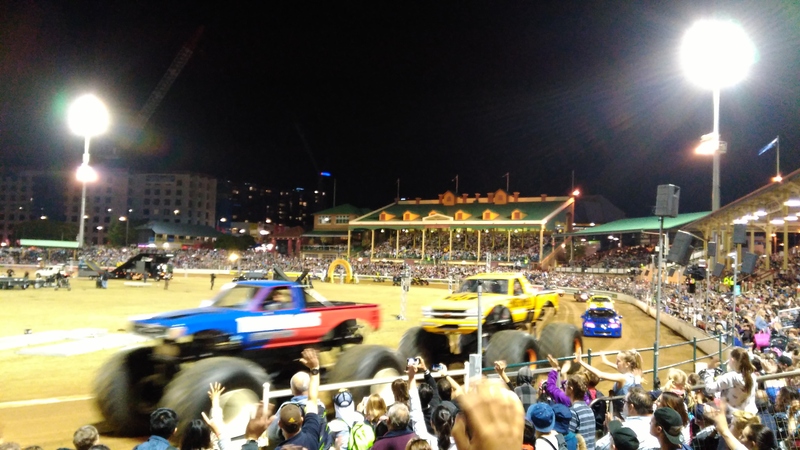 The Ekka, is Brisbane’s big annual agricultural festival, running for several days, and different parts of the area get a different day off work to allow people to attend if they wish. Wednesday was the day the company I was working for decided to take. So off to the Ekka we go. 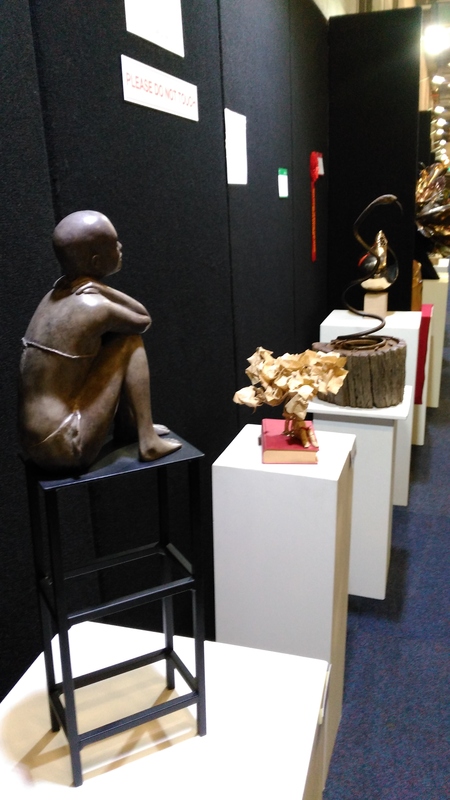 First on the list of “must-do’s” I’d been given by various colleagues in the days preceding my visit, was to visit the show bag “tent” (actually a massive tin-roofed shed). As it turns out you can cough up anything between $2 and somewhere round the hundred dollar mark to buy a bag filled with tat (sorry, useful and fun things!) on pretty much any theme you can think of. 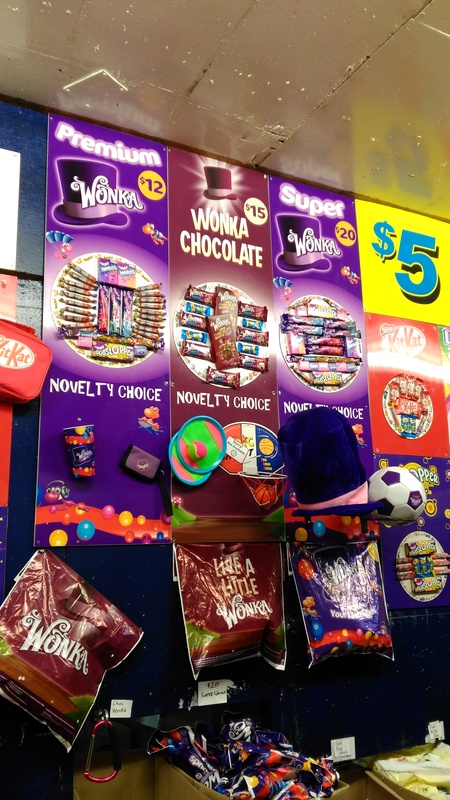 Chocolate bars from all the major producers, sweets of many kinds, beach towel, mask and plastic beaker on a Star Wars, Minions, monopoly, princess….. anything theme. Glow in the dark stuff. Water jet stuff. Plastic toys of many descriptions. It was immense! 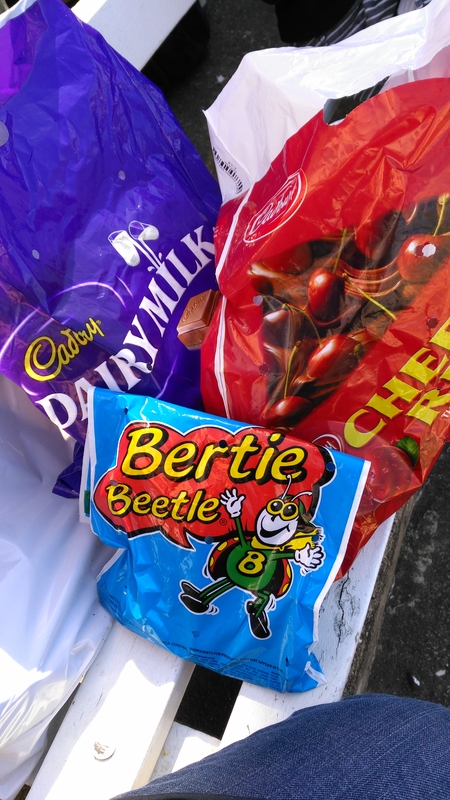 I stumped up for the Cadbury bags (I’m a bit of a fan/addict), and a Bertie Beetles bag – apparently an Ekka exclusive chocolate (having eaten it, I see why it’s not viable for general sale!). 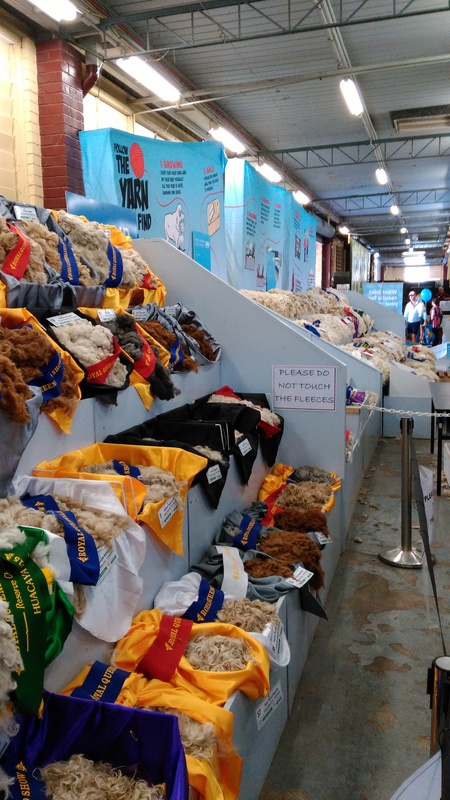 A fair few sheep have been sheared and had their coats judged! On the way to get to the animal show areas, we passed through the fairground, many food stalls, and passed by a marching band, and this very helpful sign at the entrance to the walkway connecting separated areas. After walking past the very serious looking people at the dog show, and the nonchalant llama, we entered what I can only describe as the random area. 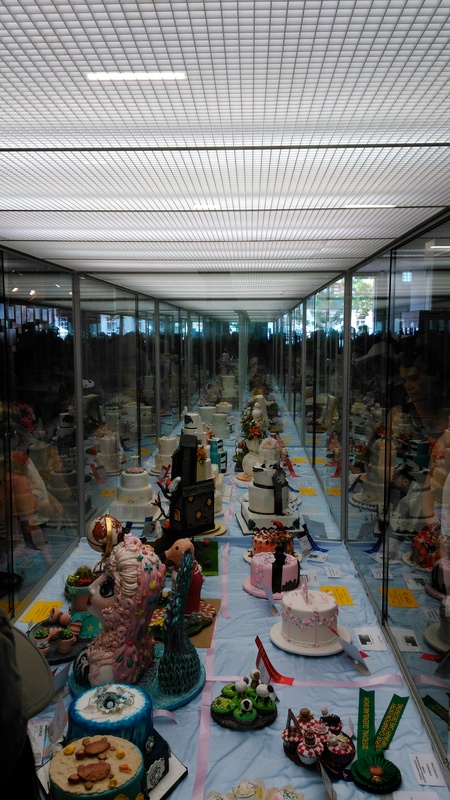 There were displays, all competitions, for skills and crafts for tons of stuff. 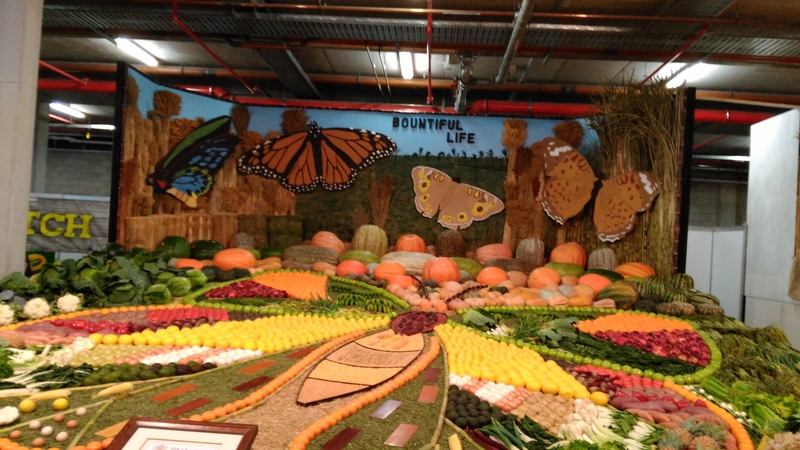 Giant vegetable growing and displays, knitted and crocheted objects, jams, preserves and cakes, honey, utility company stands, photography, paintings, sculptures…..and on and on. 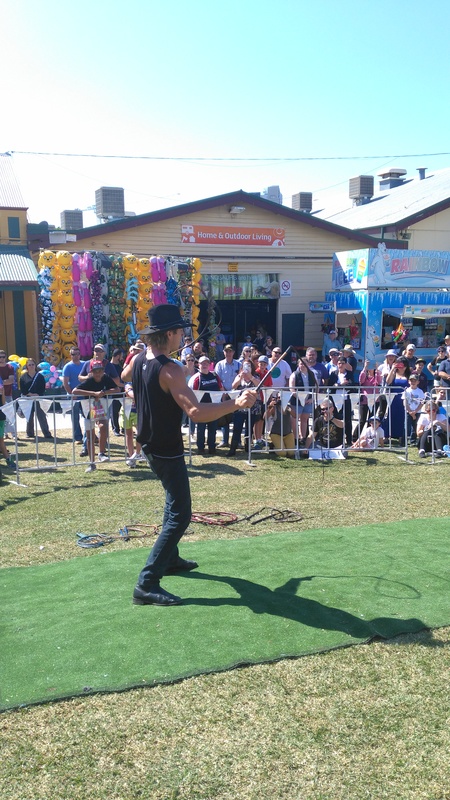 There were many ‘shows’ advertised throughout the day also…..and the whip cracker caught my attention……definitely worth watching. 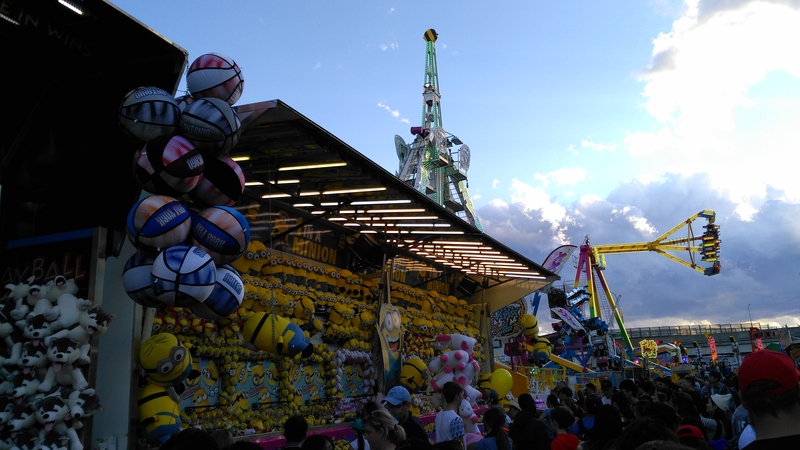 After a wander around the food court (free samples alert – another “must-do”), a little wander around the funfair…. 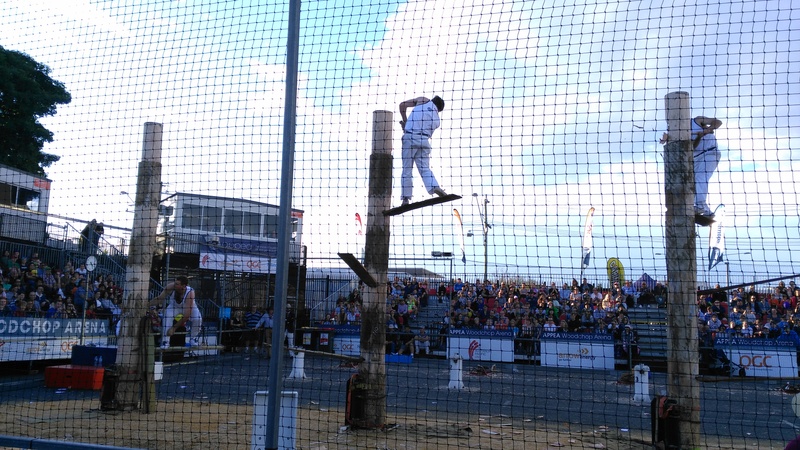 ….just enjoying watching people smiling and squealing with delight (apart from the lad who was getting distinctly greener the longer the spinning ride continued), I found myself at the wood chop finals. A lot of fast precision cutting and trust in what look like flimsy planks held in by nothing but wishful thinking. 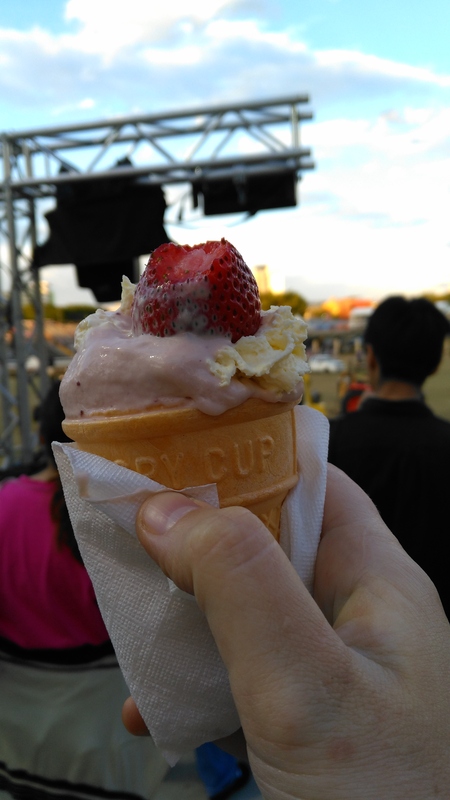 As it starts to get dark, we’re heading towards the finale in the parade ground…..so I grab the final “must-do” item (having grabbed the corn dog earlier in the day), the strawberry sundae. So off to the showring, to watch all the animals parade (including the goldfish in a bowl! 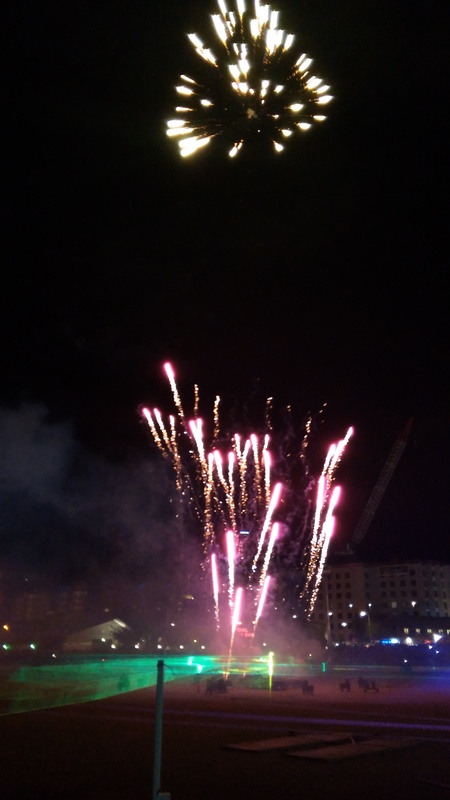 ), flying motorbike stunts, fast cars kicking dirt into the crowds as they skid around the ring, monster trucks, and of course my favourite….. fireworks. 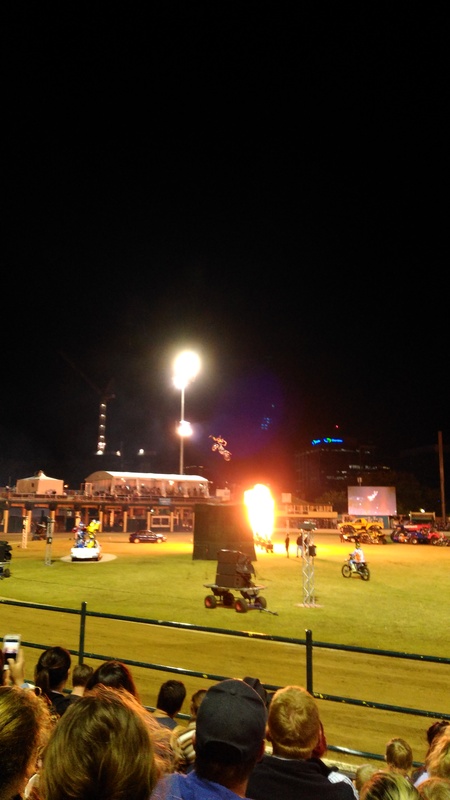 Overall a fascinating, bizarre and fun day for this Ekka first timer. 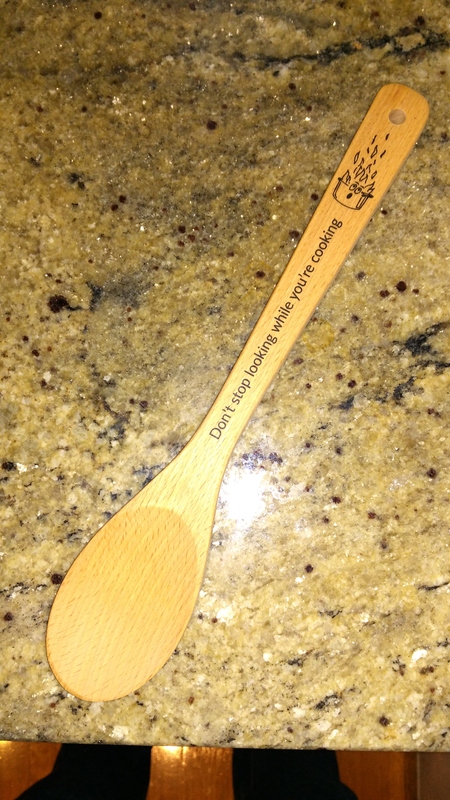 Oh and I mustn’t forget….the rather useful freebie I received from the fire service stand…..not sure what I came last in though? !